JoJo's Lite Brite Emporium: Lite brite in the Digital Age! Lite brite in the Digital Age! I've had various people message me and tell me they like the designs, or that they used one of my designs to make one of their own, but this takes it to a whole new level. 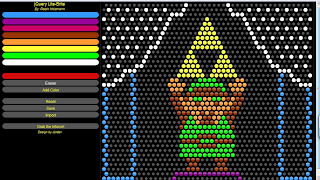 A gentleman by the name of Ralph Holzmann, a web designer, has created his very own interactive lite-brite 'game' of sorts where you can make your own lite brites! He included one of my designs, as an example in his game. He said he might include other designs of mine in a gallery, and he's constantly making updates to the game and working on making it even more realistic. Very cool stuff. Definitely worth checking out, and this inspires me to get crackin' on a new lite brite of my own!